In the simmering conflict in eastern Ukraine, Russia maintains the upper hand. But when it comes to the future of the Orthodox Church in Ukraine, Moscow is facing the possibility of geopolitical setback. Disagreements over the past are a major source of acrimony between the Moscow-based Russian Orthodox Church (ROC) and the breakaway Kyiv Patriarchate. The feuding predates the Russian-Ukrainian political conflict, which began in 2014 with the Russian occupation of Crimea, and continues to simmer in eastern Ukraine’s Donbas Region. Ukraine’s and Russia’s histories have been symbiotically linked since the dawn of eastern Slavdom. Both Ukraine and Russia trace their origins back to Kyivan (Kievan) Rus’, a loose confederation of early medieval eastern Slavic principalities. In recent decades, each country has offered divergent interpretations of their shared history. Two recent commemorative events illustrate the depth of this long-standing controversy, which has only intensified amid the conflict of the past few years. On July 28, liturgies and religious processions took place in both Moscow and Kyiv to mark the 1030th anniversary of the baptism of the Rus’ by Vladimir (Volodymyr) the Great. While at the center of festivities in both countries was one and same historical figure, Moscow and Kyiv advanced divergent narratives concerning the entity that the ancient Slavic prince ruled over, and who precisely he baptized. Kyiv’s celebrations of the two anniversaries suggest that the Ukrainian leadership is striving to uphold a historical narrative that dates the split in Ukraine’s and Russia’s historical paths back to the early Middle Ages. Most professional historians see problems with both the Ukrainian and Russian version of history: Kyivan Rus’ was neither a Ukrainian nor a Russian state, and some scholars even doubt whether it was a full-fledged state at all. Ironically, the first scholar who bluntly stated that Kyivan Rus’ was neither Russia nor Ukraine, and that it was not a state but rather a loose federation of principalities, appeared to be the 19th-century Russian historian and journalist Nikolai Polevoi. There is no question that ROC leaders perceive themselves as presiding over precisely such a universal institution. In the aftermath of the collapse of the Russian Empire in 1917, followed by the Soviet breakup in 1991, the ROC can claim to be the sole surviving institution from the imperial era, uniting under its aegis thousands of Orthodox communities on its “canonical territory” – the lands that used to be parts of the sprawling bi-continental Tsarist empire. Patriarch Kirill likes to brag about the global reach of Russian Orthodoxy, “whose boundaries stretch from one end of the earth to the other,” and highlights its primacy in “the lands of the historical Rus’” – a concept that comprises at a minimum the territories of today’s Russia, Belarus, and Ukraine. Kyiv’s efforts to achieve autocephalous (independent) status for its national church within Orthodoxy directly challenge the ROC’s geopolitical views and ambitions. The Ukrainian leadership is pursuing a two-pronged goal: to drastically curtail Moscow’s ideological influence in Ukraine; and to heal a schism within Ukrainian orthodoxy. 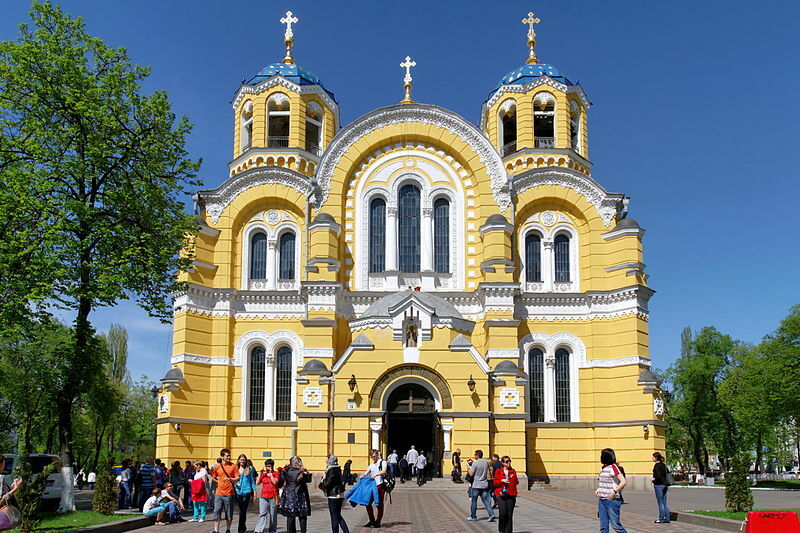 Presently, Orthodox believers in Ukraine are divided into three polities – the Ukrainian Orthodox Church under the Moscow Patriarchate, the Ukrainian Orthodox Church under the Kyiv Patriarchate and the tiny Ukrainian Autocephalous Orthodox Church. Ukraine’s chances of success hinge to a large extent on historical interpretation. Ukrainian leaders waste no opportunity to point out that it was a Kyivan prince who obtained the light of Christianity directly from Constantinople. They also assert that the transfer of the Kyivan Metropolitan see to Moscow’s jurisdiction in the end of the 17th century was marred by irregularities. Ecumenical Patriarch Bartholomew of Constantinople (based in Istanbul) is a crucial figure in this politico-ecclesiastical intrigue, and he appears to be supportive of Ukrainian claims. In what seemed to be a response to a direct appeal by Poroshenko, who personally asked Bartholomew to grant the Ukrainian national church autocephaly during an audience in Istanbul this spring, the patriarch forcefully asserted Constantinople’s right to independently resolve the Ukrainian church issue. Notably, this statement came on the heels of an August 31 meeting in Istanbul between Bartholomew and Patriarch Kirill, the ROC chief, at which the Russian church leader sought to dissuade Constantinople from supporting Kyiv’s quest for church independence. Ultimately, the achievement of autocephaly within Orthodoxy is a political process that has tended to run parallel to the collapse of empires and the establishment of independent nation-states. That’s how the autocephalous Greek, Rumanian, Bulgarian, and Albanian Orthodox churches emerged in the course of the Ottoman Empire's demise throughout the 19th and early 20th century. If that pattern holds, then, the Kyiv Patriarchate should gain official recognition in the not-so-distant future. Igor Torbakov is Senior Fellow at Uppsala University and at the Swedish Institute of International Affairs in Stockholm, Sweden.